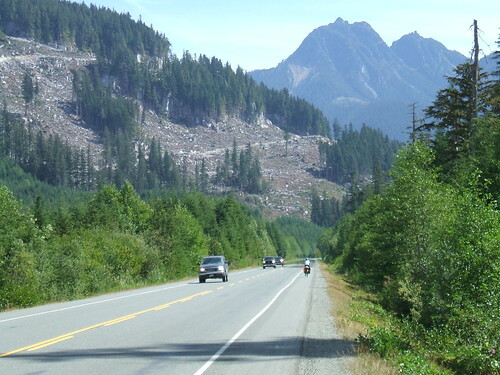 Vancouver Island is about 300 miles long on the highway. We had a pleasant time touring it, but were surprised by the traffic on the narrow road up north (no surprise since we've been on the easy northern roads for so long). The section from Port Hardy to Port McNeil was quite pleasant, and we really liked Alert Bay, and also went to Sointula. Very nice cycling. From Port McNeil to Campbell River was quite bad - much of it has no shoulder, and there are lots of big trucks, including logging trucks. From Campbell River to Nanaimo was rideable, but not terribly pleasant. There was a lot of traffic on a road with adequate shoulder, but certainly too much traffic. From Nanaimo south, the roads were great, like New England. Small country roads with little traffic and nice views (and nice hills). Very pleasant. Lots of access to the various islands. We used a bicycle-specific map for this area, the "Victoria/Gulf Islands Cycling and Walking Map". It gave lots of information about the various routes and got us off the main highway. And the Victoria area (especially Sidney) is delightful, with lots of access to everything for cyclists.